This page highlights some of the options we provide for Hydro Multi-E Pump Systems. Additional products and sizes are available. Contact us to speak with a specialist. Multiple pump systems offer increased hydraulic efficiency at part load versus the typical pump systems that have a variable flow rate requirement, spending the majority of operational time in the lower part load condition. The Grundfos ECM MLE motors exceed motor efficiency standards, set by the International Electrotechnical Commission (IEC). NEMA premium efficient motors are equal to IE3 level, so these motors represent two levels above NEMA premium. Due to the increased efficiency, energy consumption and operation cost decrease by 7-9% approximately based on a typical domestic water load profile. Grundfos BoosterpaQ systems offer constant pressure, constant flow, temperature stabilization and automated pump system communication and redundancy. 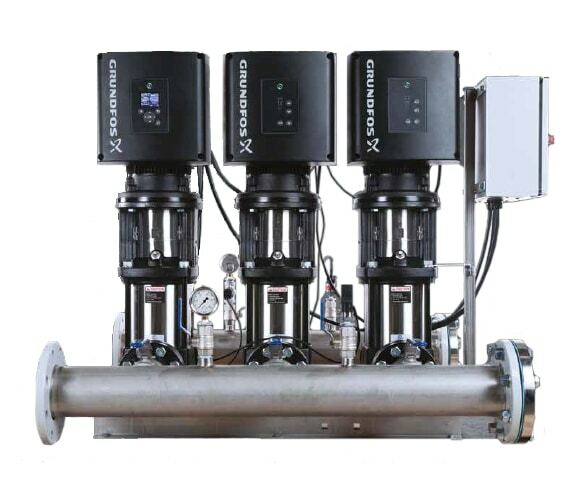 Whether it is a high rise building, hospital, motel or any other variable flow application, we can meet your needs with the Grundfos BoosterpaQ. Contact Vantage Pump’s experts for sizing per your application.